:Elmer Towns's Fasting for Spiritual Breakthrough has become must-reading as this powerful spiritual discipline of fasting has seen a revival among followers of Christ. Now Towns digs deeper into one of the most popular forms of fasting today, the Daniel Fast. 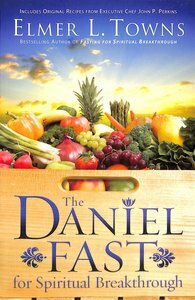 With an emphasis on a healthy, simple diet, the Daniel Fast is named after the prophet Daniel who participated in a partial fast for spiritual purposes. Daniel was taken captive into Babylon when he was sixteen years old. The Babylonian king wanted the young prophet to help him administer his rule over the captive Jews--and he wanted to "Babylon-ize" Daniel, to make the young man of God more like him. The first step the king took in his campaign was to provide a sumptuous feast to tempt Daniel--food fit for a king-- basically fattening comfort foods. In response, the prophet refrained from the king's table, choosing instead to eat only vegetables and to drink only water. He honored God over the king. Dr. Elmer Towns introduces readers to the spiritual, physical, and mental basics of the Daniel Fast, coaching them through either a ten-day or twenty-one-day period of renewal, and he includes original Daniel Fast recipes created by executive chef John P. Perkins. Dr. Towns addresses practical questions, such as what to eat and when, as well as how to pray effectively. Readers will learn how to encounter God during their fast, how to worship through self-discipline, and how to pray for specific answers. They will also explore the role of weeping, repentance, and spiritual warfare in their life of faith. Daniel is a model to God's people of someone who chooses spiritual nourishment over bodily satisfaction, in The Daniel Fast for Spiritual Breakthrough, God's people can learn to follow his example. About "The Daniel Fast For Spiritual Breakthrough"